There is no better way to experience Ontario’s vast wilderness and incredible fishing then spending a week at a remote wilderness outpost camp in Northwestern Ontario. Fishing is incredible. Both of our outpost lakes are stuffed with Walleye, Northern Pike, Smallmouth Bass and Perch. Vaughn Lake and Lynx Lake are both located at the south-end of Lac Seul and north of Dryden Ontario. Fifty to one hundred Walleyes can be caught in a single day by one fisherperson with some reaching 10-pounds. Both our outpost lakes are Walleye factories. Northern Pike reach great sizes with 20-pounders being caught-&-released with the biggest in recent years reaching 30-pounds. 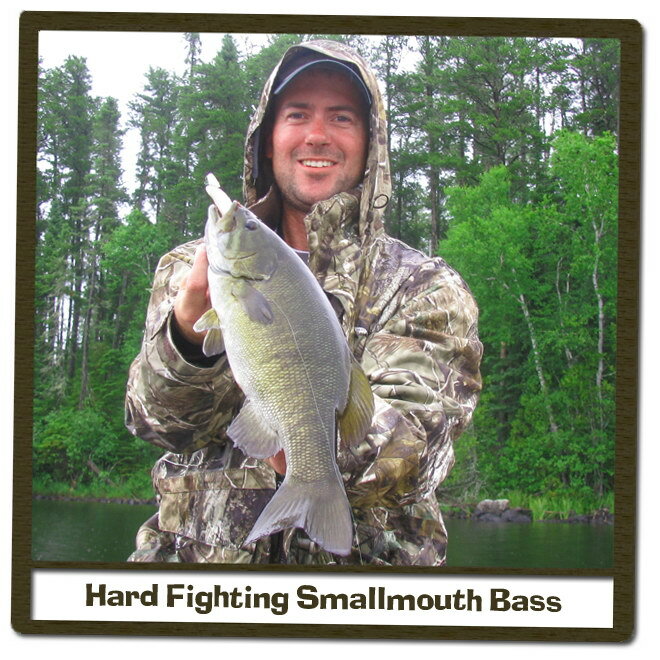 Smallmouth Bass are plentiful in all sizes with some reaching 6-pounds. Perch are also common and reach the size of Jumbo Perch. With a sports license, you can bring fifty Perch Home. We also offer big game adventures. Moose Hunting and Black Bear Hunting take place at our Lynx Lake Outpost in WMU 5. Moose in Ontario are plentiful with some Moose reaching 1500 pounds. Black Bears are common in the 175 to 250-pound range with some exceeding 400-pounds. Mornings don’t get any better than stepping outside into that crisp, clean northern air. You will find safe and dependable boats equipped with swivel seats and the finest outboard motors to take you to that honey hole. Spend the morning fighting northerns and reeling in walleyes. Take a break and stop to fix a shore lunch of mouth-watering walleyes. Enjoy the crackle of the campfire, smell of wood smoke, aroma of coffee brewing, along with the fish sizzling and beans simmering. Sit back and relax, take time to reflect on the beauty God has created, the majestic pines, pristine Canadian waters and the deafening silence. When it is finally time to say good-bye, you will leave with a lifetime supply of unsurpassed memories that will make you want to come back year after year. Both Vaughan Lake and Lynx Lake are stuffed with Walleye, Northern Pike, Smallmouth Bass and Perch. 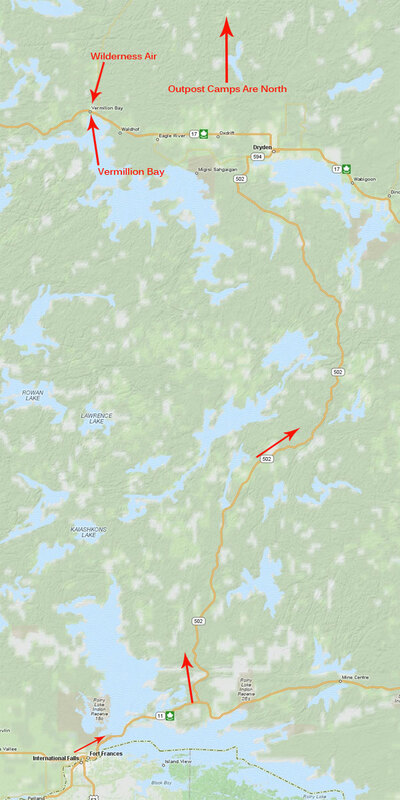 Both located at the south-end of Lac Seul and north of Dryden Ontario. Fifty to one hundred Walleyes can be caught in a single day by one fisherman with some reaching 10-pounds. Both our outpost lakes are Walleye factories. 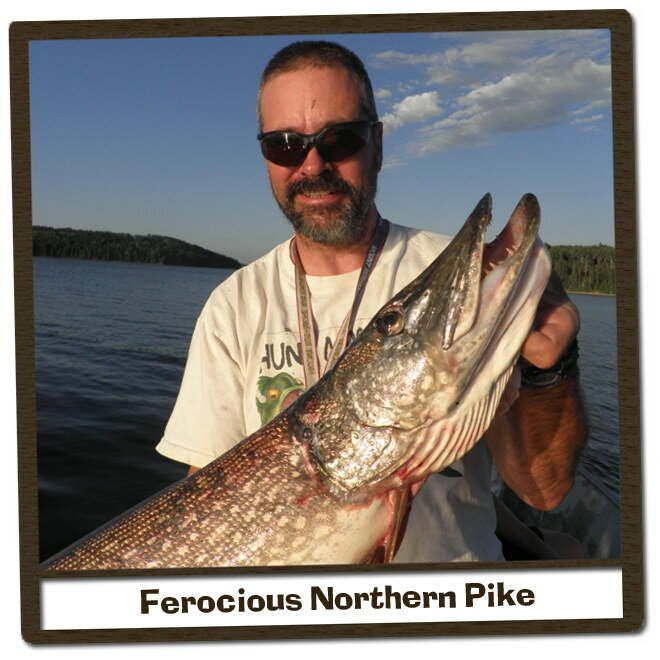 Northern Pike reach great sizes with 20-pounders being caught-&l-released with the biggest in recent years reaching well over 25-pounds. Smallmouth Bass are plentiful in all sizes with some reaching 6-pounds. Perch are also common and reach the size of a Jumbo Perch. With a sports license for Fly-In Fishing Ontario Canada , you can bring fifty Perch Home. Vaughan Lake & Lynx Lake outposts are equipped with new dependable 16′ extra wide Lund boats with new 9.9hp and 15hp Yamaha motors. The boats are large enough for 3 people and all their gear. Each boat is equipped with swivel fishing seats, nets, life cushions, minnow buckets, and paddles.